The Sarantakos Hall is a convenient and elegant venue for your special occasion with a host of amenities that can accommodate nearly every kind of event. Decorated in warm tones, the room is complete with carpeted floors, chandeliers, dance floor, a stage, and introduces guests through an attractive entry foyer. Additional features include a full commercial kitchen, parking to accommodate your guests, and large rest rooms. 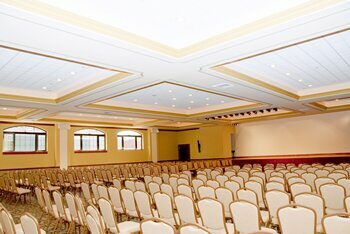 The Sarantakos Hall is large enough to accommodate up to 400 seated guests. All facility rental fees include the setup and removal of tables, chairs, and complimentary parking in our private lot (capacity: 60 vehicles). Linens and catering are not included, but can be arranged through one of our preferred catering companies. For specific rental fees please contact the Church Office. For banquet or refreshment needs, please contact the Church Office. 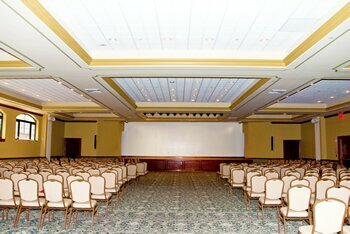 The caterers will be happy to handle all food and banquet needs as well as set-up, teardown and clean up.